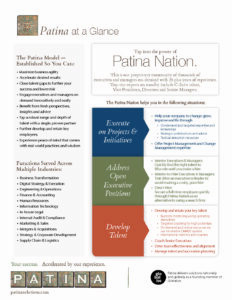 We offer many different ways for members of Patina Nation to earn income. With that in mind, here are details on our Executive Introduction Program. If you are willing to help us meet certain company leaders you know well in big, medium, and small companies or non-profits – we will recognize you for your help with a “thank you” of cash, gift cards or a charitable contribution in your name. If the introduction you make leads to revenue for Patina – we will happily share some of the financial success with you in the form of commissions. We don’t ever expect you to try and sell anything on behalf of Patina – just making the warm introduction to an executive is highly valuable to Patina. We seek to meet with a variety of executives and senior managers across industries, roles and functions including the entire C-suite, HR, IT, Finance & Accounting, Operations, International and more. Our client list is impressive – so you can be assured our approach to working with sophisticated clients is highly professional and consultative. Please let us know if you have a strong connection to executives or senior managers and are willing to introduce us to them. From time to time – we may spotlight one particular company to focus on. Once you submit the information to us – we will follow up with you to discuss the best way forward (please know we will not contact your person until we have agreed to a plan of action with you). We would be honored to share the Patina value proposition with your respected colleagues. Thank you for your interest and your help!